LOVE TO BOWL BUT SCARED YOU “AREN’T GOOD ENOUGH”? NO NEED TO WORRY WE HAVE A LEAGUE OPENING FOR YOU! 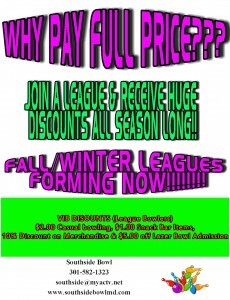 All adult leagues are MONEY leagues…..any leagues with Youths are strictly trophy leagues! available at main counter of Southside Bowl. is also a handicap league which allows for everyone to be competitive. Looking for individuals or Teams to join in our fun handicap league. growing Southside family…..you will have a great time! Adult duckpin leagues on Monday, Tuesday, Wednesday, Thursday, Saturday & Sunday’s! League bowlers receive a special VIB Card for Special Discounts on Practice/Casual Bowling Games just $2.00 each day, $5.00 off Lazer Bowl Nights and get to take advantage of a special $1.00 menu at the snack bar!!!! We have many different leagues that range from beginners to the advanced bowler! ***For those not familiar with the term “Handicap” league—In this type of league you and your team mates will get free pins to add to your game that will keep you even (up to a certain score) with everyone in the league. So, Whether you bowl a 20 game or a 200 game you still have a chance to win! ***Scratch Leagues mean you do not receive any extra pins…..you simply bowl with your team mates against other teams heads up. Have a large family or group of friends? Start a league of your own! Adult Winter Leagues are now forming for both Duckpin & Tenpins!! 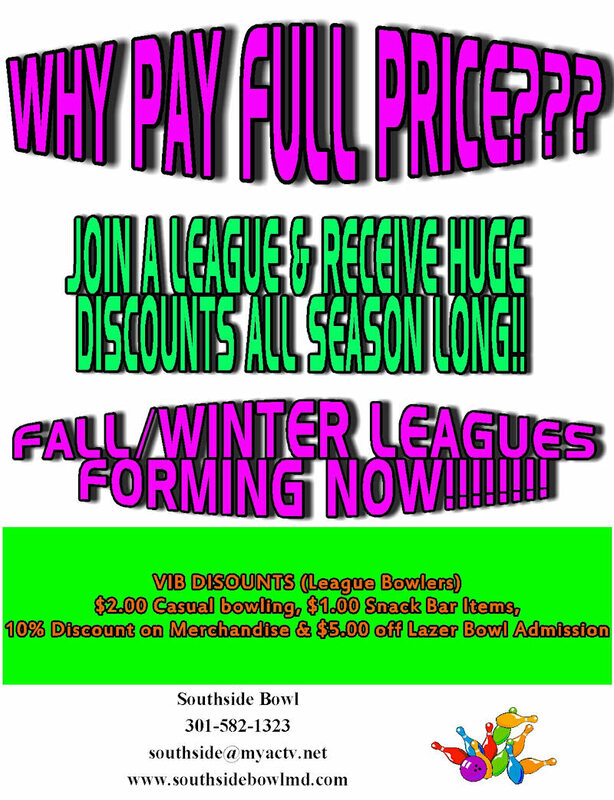 We have many different leagues to choose from….contact us today to find the league that is right for you! Beginner without equipment or knowledge….no problem! We have many long time bowlers in all averages and staff who are friendly and willing to help you learn the game of bowling the right way….the FUN way!! No need to worry about “clicks” and feeling out of place…..join us in a friendly fun atmosphere where everyone is part of our family! Stop by, call us at 301-582-1323 or send us an email at southside@myactv.net! Tuesday Night Mixed League….is looking for bowlers who would like to have fun on our mixed (handicap) league! Wednesday Night Adult/Youth league….a mixture of adults & youths 4 person team (no limits on mixture as long as there is atleast 1 adult and 1 youth per team). This league is also a handicap league which allows for everyone to be competitive. Friday Night Mixed is searching for a team of 5 people to fill a 12 team league! This is a long running fun competitive league. League starts the last Friday in August….but only 5 spots remain so sign up today!! Saturday afternoon Youth League….want to learn how to bowl? Then this is the league for you! Youths from 6-19 can qualify to earn scholarship money along the way! At just $8.00 per week it is a great way to make new friends, learn the skills of bowling & earn some scholarship money for college along the way! Come join our growing Southside family…..you will have a great time! Subscribe to the Southside Bowl mailing list to receive information about special offers!